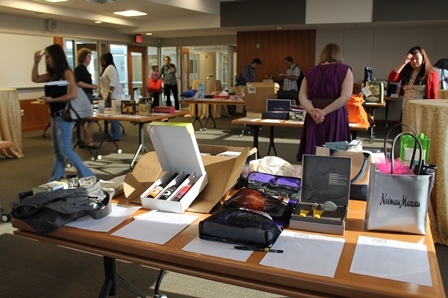 A scene from our awesome 2012 silent auction. As we gear up for our annual conference this fall at Poynter, we want to hear from our members past and present — and from any past conference attendees — about how the Society for Features Journalism has helped you. We would love to hear why you attended the conference and what’s the best idea you picked up at a recent SFJ conference that you put to use in your newsroom? As the features editor of The Roanoke Times, I’ve attended five conferences and have felt recharged at each one. It’s a great way to network and meet other features editors and learn from one another. It’s also nice to have the time away from the daily pressures of the office to evaluate our jobs and challenges, and get advice if needed. Thanks to the Show & Steal sessions, I’ve brought back great ideas to reproduce at my paper, including asking readers for their hilarious Scared of Santa photos. And you’ll never fail to find something amazing at our annual silent auction to benefit our diversity fellows program. Now it’s time for you to share your testimonial. How did the conference help you in your job? Leave your comments below or tweet us at @WeareSFJ. We may share some of your thoughts in our conference program this year. This entry was posted in See all About SFJ posts, SFJ testimonials and tagged SFJ conference, Society for Features Journalism, testimonial. Bookmark the permalink.